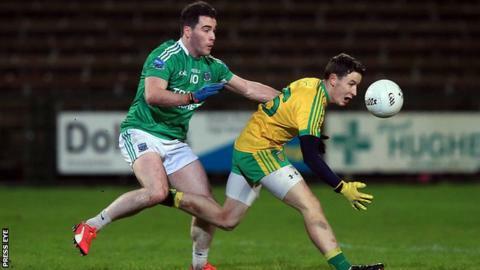 Fermanagh set up a Dr McKenna Cup semi-final against Tyrone as they earned a 0-12 to 0-8 win over an experimental Donegal side at Brewster Park. Donegal moved a point up early in the second half after the sides were level at the break but Sean Quigley finished with 0-5 at Fermanagh pulled clear. Michael Murphy started for Donegal with Odhran MacNiallais hit 0-3 for them. Two Packie Downey goals helped Down end St Mary's semi-final hopes as the Mournmen won 3-20 to 2-14 at Newry. While Donegal boss Rory Gallagher is unlikely to be too disappointed, it was still a notable scalp for Pete McGrath and Fermanagh, who cruised into the Sunday's knockout stages with a 100% record. Considering the time of year and the fact they may meet later in the year in a far more important Ulster championship clash, it was a decent spectacle. Odhran MacNiallais was the most impressive player on the pitch, kicking three first-half points from play. A superbly converted 30m sideline kick by Quigley was the pick of the first-half scores as the Ernemen fought back from 0-5 to 0-3 to level at 0-5 to 0-5 by the break. Michael Murphy struggled with his range from dead balls in the first half, kicking one free wide while another dropped well short. Martin McElhinney was one of Donegal's half-time substitutions but he lasted less than 10 minutes after getting a black card for a trip. While Tomas Corrigan had an off night and was substituted midway through the second half, his full-forward partner Quigley got into a great rhythm with his dead ball striking and nailed a 45m effort to put the home side 0-9 to 0-7 ahead after 52 minutes. Although MacNiallais narrowed the deficit with a left-footed free, Fermanagh sub Pat Cadden got on the end of a well-worked move to restore their two point cushion with just over 10 minutes to go. Cadden scored again from play, with Quigley nailing another long-range free to open up clear daylight between the teams three minutes from time. St Mary's hit the three opening scores at Newry and they also held 0-6 to 0-3 and 0-8 to 0-4 leads in the first half before Down reduced the margin to 0-10 to 0-9 by the interval, with Arthur McConville impressing for the home side. An Aidan Garrity goal helped St Mary's move 1-11 to 0-11 ahead but Cathal Doyle's goal was part of an unanswered 1-4 for the Mournemen as they moved four ahead. Doyle had come on for the black carded Mark McKay in the first half. Packie Downey's goal with his first touch after being introduced helped extend Down's lead to 2-19 to 1-12. A Niall Toner goal reduced Down's lead to 2-20 to 2-13 but Downey added his second goal before the finish as Down ran out nine-point winners.